Background: Early onset dementias have variable clinical presentations and are often difficult to diagnose. We established a family pedigree that demonstrated consistent recurrence of very early onset dementia in successive generations. Objective and Method: In order to refine the diagnosis in this family, we sequenced the exomes of two affected family members and relied on discrete filtering to identify disease genes and the corresponding causal variants. Results: Among the 720 nonsynonymous single nucleotide polymorphisms (SNPs) shared by two affected members, we found a C to T transition that gives rise to a Thr147Ile missense substitution in the presenilin 1 (PS1) protein. The presence of this same mutation in a French early-onset Alzheimer’s disease family, other affected members of the family, and the predicted high pathogenicity of the substitution strongly suggest that it is the causal variant. In addition to exceptionally young age of onset, we also observed significant limb spasticity and early loss of speech, concurrent with progression of dementia in affected family members. These findings extend the clinical presentation associated with the Thr147Ile variant. Lastly, one member with the Thr147Ile variant was treated with the PKC epsilon activator, bryostatin, in a compassionate use trial after successful FDA review. Initial improvements with this treatment were unexpectedly clear, including return of some speech, increased attentional focus, ability to swallow, and some apparent decrease in limb spasticity. Conclusions: Our findings confirm the role of the PS1 Thr147Ile substitution in Alzheimer’s disease and expand the clinical phenotype to include expressive aphasia and very early onset of dementia. The copy of record is available from the publisher at https://doi.org/10.3233/JAD-150051. Copyright © 2015 IOS Press and the authors. This article is published online with Open Access and distributed under the terms of the Creative Commons Attribution Non-Commercial License. Denvir J, Neitch S, Fan J, Niles RM, Boskovic G, Schreurs BG, Primerano DA, Alkon DL. 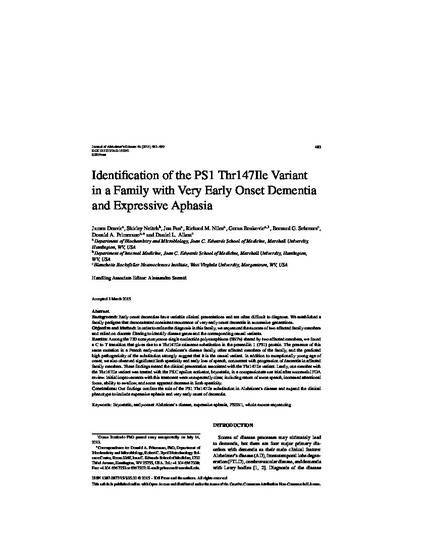 Identification of the PS1 Thr147Ile variant in a family with very early onset dementia and expressive aphasia. Journal of Alzheimer's Disease. 2015;46(2):483-90.